Well, actually, I have three jobs technically and like them all, but my job as a pistol instructor I absolutely love. Yesterday's class reminded me to be thankful for what I have and the life I'm able to lead. I've decided to jot a few notes down to remind myself of why I love this job. My students are awesome. Oh sure, occasionally I'll get some jerk in class and it'll try my patience, but largely my students have been top notch. We get the gambit of student abilities; everybody from the little old ladies who have never shot, to younger kids just getting into shooting under mom and dad's watchful eyes, to ex-law enforcement and veterans. I've had kids mandated by courts to take firearm safety, to ladies that picked up a stalker, or others that have recently experienced some criminal intent. We are able to get some on track, some really don't need much help, some will never get it. In the end, if they want a Conceal Carry permit, they have to obtain training. I'm surprised that the state requires recent Vets (even an MOH recipient) to obtain training. Our students experiences are as varied as there are guns to shoot. If you are a people person, this job is very rewarding and very interesting. If you are a gear head you would love being an instructor. We see the most current offerings and get feed back on it quickly. We can put many rounds through a gun in short order to find out how it holds up. We see the latest holster designs, the newest 1911 offerings and newest generation releases from Glock, Springfield and S&W. Oh, it's quite fun. We let a S&W 1911 run for 3000 rounds without cleaning just to see if it would stop - it never did and my respect for that offering jumped up a few notches. Finally, just felt guilty about not showing the gun some love and broke down and cleaned it. I learned to love a Glock 34 after shooting a nickel sized groups with it on several occasions. It's a great time to be into guns, the offerings have never been better and the options never more fun. If only ammo would come down to the 2006 prices. While I gripe about ammo pricing, I probably pay less than most and I'm thankful to Tim and Lisa for it. The store I instruct through discounts very deeply for instructors and we help push volume through their store. A class will consume anywhere from 17 to 30 boxes (sometimes more) of ammo at a shot. We utilize every major manufacturer of ammo and we get to see what works and what puts out big clouds of exhaust. Then there are the left overs...the rounds that don't get consumed during class - ;-) We do have to practice - stay tuned up - students want to know that their instructors can keep a tight group, that the guns are capable of shooting a ragged hole group, even if it's beyond their capability at this point. But come on, it's fun, or we wouldn't be doing it...getting paid to shoot. One more item. I get to work with the best shooters and instructors in the area. I'm thankful for their knowledge and experience, because foremost I'm a student, I'm a student of all things gun and defense. I've enjoyed working with others to create classes that, hopefully, make a difference in someones life. 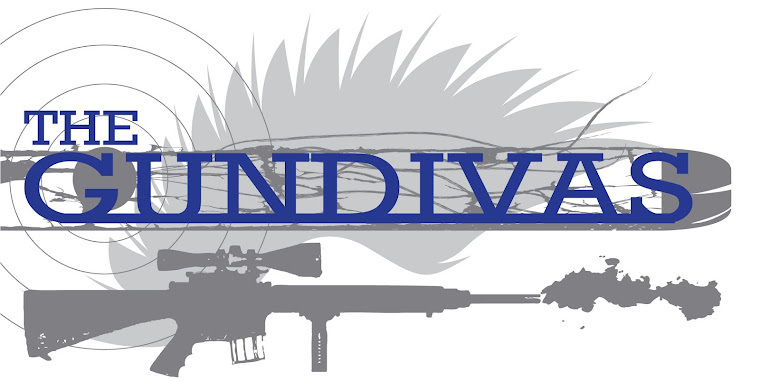 A note from GunDiva: check out our training tab for upcoming classes. Double Tap has just added Tactical Carbine to the mix. My hubby had the chance to preview it over the weekend and hasn't stopped talking about it. It is kind of a cool gig, isn't it? I never imagined how much I would love teaching or how much I would learn from the students.